God reckons us righteous in Christ. When we live Christ, He is expressed in our living as righteousness. The women who were the first to learn of the Lord’s resurrection “came to the tomb as the sun rose.” The sun rising to begin a new day is a picture of resurrection beginning a new age. The “sun” of this age will rise to a full day, consummating in the city of resurrection, New Jerusalem. We, in ourselves, are not righteous before God, but Christ has become our righteousness! As we live Him, He becomes our righteous actions, our righteousnesses, as our wedding garment (Rev. 19:8) that we may participate in the wedding feast. The Lord Jesus told His disciples that at the end of this age “the righteous will shine forth like the sun in the kingdom of their Father”(Matt. 13:43). In Malachi 4 the Lord is the rising Sun of righteousness; it seems that He is separate from us. But, in Proverbs 4 and clearly in Matthew 13, we shine. We shine, but the light is not of us. 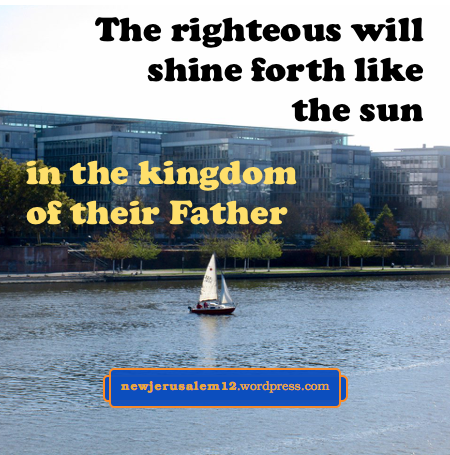 We shine because Jesus Christ is in us, and through our living Him out as our righteousness, we become constituted with Him to be righteous subjectively/experientially and thus we shine. This righteous will increase into the new creation (2 Peter 3:13) and the shining will increase to New Jerusalem, the city having the glory of God. “He who believes into the Son has eternal life” (John 3:36). When we believe into Jesus Christ, we immediately receive eternal life. This life grows in us and brings us to New Jerusalem, the city of eternal life. Our reconciliation was accomplished by Jesus Christ through His death on the cross. By His resurrection the divine life was released and by believing we have received it. Now this life is saving us from our sins, our negative attitudes, the world, our fleshly living, and many other things. 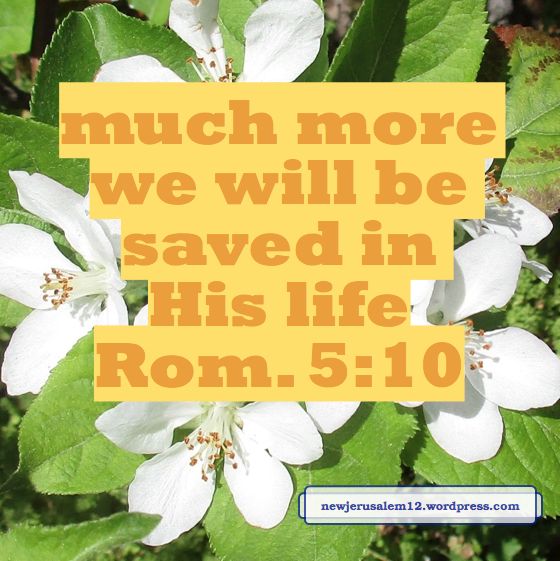 This is a “much more” salvation! This salvation brings us ut of everything that is not in New Jerusalem and fills us with all the riches that will be displayed in New Jerusalem. Romans 5:17 continues, “much more those who receive the abundance of grace and of the gift of righteousness will reign in life through the One, Jesus Christ.” We received eternal life once for all. 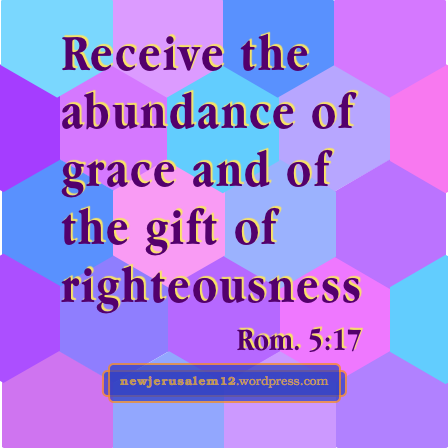 Now we receive the abundance of grace and the gift of righteousness with the result that we will reign in life, ultimately reigning in New Jerusalem (Rev. 22:5). Romans 5:21 declares “In order that just as sin reigned in death, so also grace might reign through righteousness unto eternal life through Jesus Christ our Lord.” Jesus Christ is all-inclusive; He is our Lord, our grace, our righteousness, our life. Whenever we turn our heart to Him (2 Cor. 3:16) He brings us onward toward reigning in life in New Jerusalem. Revelation 20 begins with the devil cast into the abyss (v. 1-3). Then there is the blessing of being priests and kings in resurrection with God and Christ for a thousand years (v. 4-6). This is a foretaste of New Jerusalem. In verse 7 the devil is temporarily released but by verse 10 he is cast into the lake of fire for his eternal punishment. 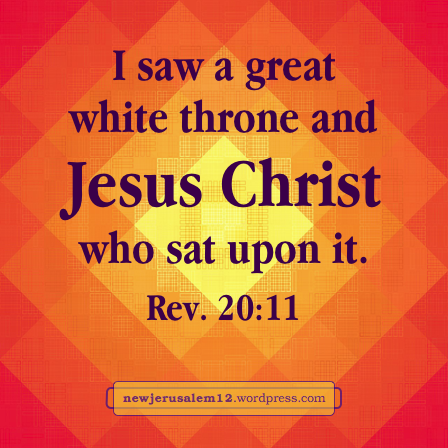 Verse 11: “I saw a great white throne and Him who sat upon it.” The Lord Jesus Christ is Him who sits on the throne, because He is “the One who was designated by God to be the Judge of the living and the dead” (Acts 10:42). The Lord Himself spoke of this designation in John 5:26-27, “For just as the Father has life in Himself, so He gave to the Son to also have life in Himself; and He gave Him authority to execute judgment because He is the Son of Man.” As the Son of Man, the God-Man, Jesus both gives us eternal life and judges the dead. “In righteousness He judges” (Rev. 19:11). Although today’s courts have flaws, our Lord is perfectly righteous. In verses 12 and 13 the dead are judged. In verses 14 and 15 death and Hades, and anyone whose name is not written in the book of life, are cast into the lake of fire. This judgement is the last cleaning of the earth. After this, there is nothing old, nothing dead, nothing sinful. This judgement opens the door for New Jerusalem with the new heaven and new earth. The old “earth and heaven fled away, and no place was found for them” (v. 11) and “the first heaven and the first earth passed away” (21:1). There is “a new heaven and a new earth” and “New Jerusalem coming down out of heaven” (21:1-2). Revelation 21:8 and 22:15 speak of people who are not only outside New Jerusalem but also in the lake of fire. These verses are the ultimate development of 1 Corinthians 6:9-10, Galatians 5:19-21, and Ephesians 5:5, which name many unrighteous things saying, “those who practice such things will not inherit the kingdom of God.” The kingdom which they will not inherit consummates in New Jerusalem with the throne of God and the Lamb as its center. We, in ourselves, are not better than those people. 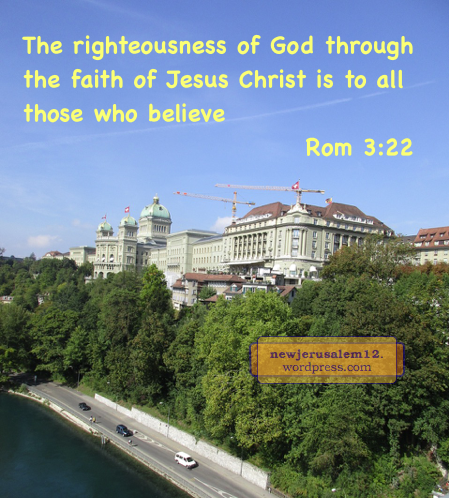 The difference is that we have, by faith, received Christ as our righteousness. The first stage of this receiving is our initial repentance and believing in Christ. The continuing stage is our daily pursuit of Christ. Our pursuing is to receive more of Him as our righteousness. “Those who receive the abundance of grace and of the gift of righteousness will reign in life through the One, Jesus Christ” (Rom. 5:17). This reigning in life is more than having Christ as our objective righteousness. It is living Christ out as our daily righteousness. 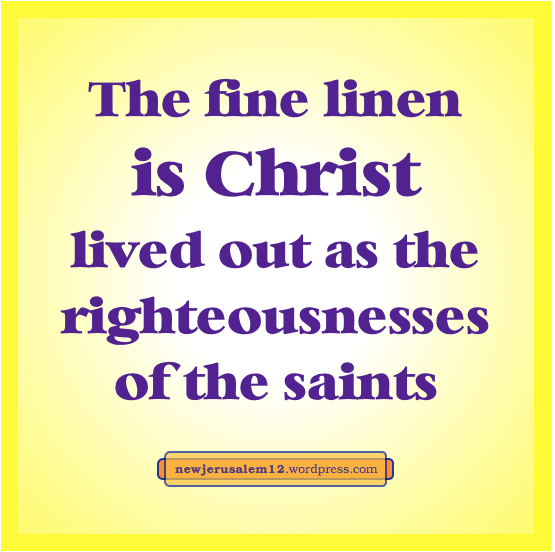 Jesus Christ being our righteous living is portrayed in Revelation 19:8: New Jerusalem, the bride of Christ is “clothed in fine linen, bright and clean; for the fine linen is the righteousnesses of the saints.” These righteousnesses (plural) are the Christ we live out day by day. This living is also in Revelation 22:14, “Blessed are those who wash their robes that they may have right to the tree of life and may enter by the gates into the city.” Our washing is actually His washing of us in response to our confessing (1 John 1:9). This washing gives us right to the tree of life, Christ as our life and life supply. By this supply we live Him out. His living through us is bright and pure, matching New Jerusalem, thereby bringing us into it in reality. Thank Him that He enables us to be inside New Jerusalem and not outside. 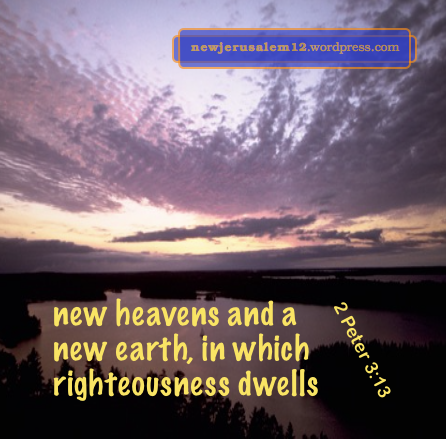 Second Peter 3:13 says, “according to His [God’s] promise we are expecting new heavens and a new earth, in which righteousness dwells.” This means there will be no unrighteousness in the new creation, so no unrighteousness in New Jerusalem, the center of the new creation. This is another clear word that sin will not be in New Jerusalem. 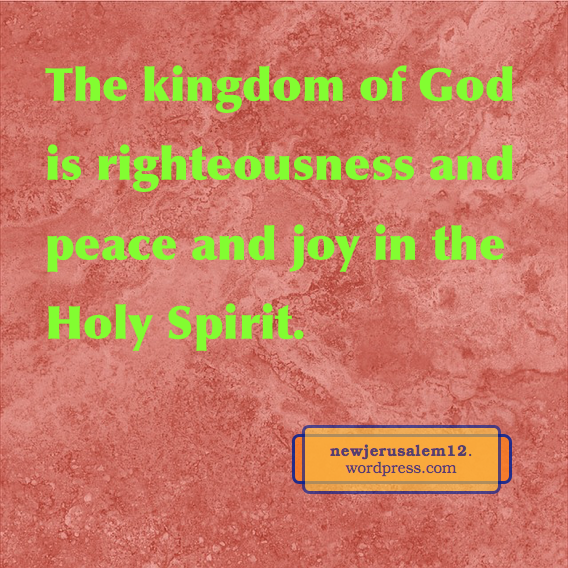 In New Jerusalem there is no sin, no death, no devil, and no unrighteousness. In contrast, Jesus Christ is our redeemer, our life, our God, and our righteousness. In New Jerusalem the redeeming Lamb is on the throne (Rev. 22:1, 3), the river of life and tree of life supply us eternally (Rev. 22:1-2), the Lord God will shine upon us (Rev. 22:5), and Jesus Christ the Righteous (1 John 2:1) fills the city with righteousness. Praise Him for the redemption, life, and righteousness in New Jerusalem. “According to His promise we are expecting new heavens and a new earth, in which righteousness dwells” (2 Peter 3:13). The new creation, with new heavens and earth, includes New Jerusalem (Rev. 21:1-2). The same sense of dwelling is used in regard to God: “God…being Lord of heaven and earth, does not dwell in temples made with hands” (Acts 17:24), and “in Him [Christ] dwells all the fullness of the Godhead bodily” (Col. 2:9). The Greek word is also applied to the Triune God in us: “Christ may make His home in your hearts through faith” (Eph. 3:17) and “the Spirit, whom He has caused to dwell in us” (James 4:5). In light of the usage of this word everywhere else in the New Testament, to say that righteousness dwells in the new creation means that this righteousness is alive. We do not use dwell with inanimate objects; for example, we never say that a table dwells in our dining room. Christ is “the Righteous” (1 Peter 3:18, 1 John 2:1). He is on the throne in New Jerusalem at the center of the new creation. I believe that His presence and the righteousness of His person, radiating out from New Jerusalem, is the righteousness which dwells in the new creation. And this Christ, who is our righteousness today (1 Cor. 1:30) is the righteousness of New Jerusalem. New Jerusalem is pure, clean, clear, and transparent. New Jerusalem, as the bride of the Lamb, is also bright: “it was given to her that she should be clothed in fine linen, bright and clean; for the fine linen is the righteousnesses of the saints” (Rev. 19:8). Within New Jerusalem is “a river of water of life, bright as crystal, proceed-ing out of the throne of God and of the Lamb in the middle of its street” (Rev. 22:1). The brightness is from the Lord Jesus Himself. He says, “I am the Root and the Offspring of David, the bright morning star” (Rev. 22:16). When He appeared to Saul from heaven, He was “a light from heaven beyond the brightness of the sun” (Acts 26:13). New Jerusalem is a composition of God in Christ dwelling in all God’s redeemed people. The city is bright not only because the Lord Jesus is bright. It is bright because He is living with every redeemed person and will make each one bright with Him. The Lord spoke about this in Matthew 13. At His second coming, His angels will cast out all who are stumbling blocks and all who practice lawlessness (v. 41). “Then the righteous will shine forth like the sun in the kingdom of their Father” (v. 43). 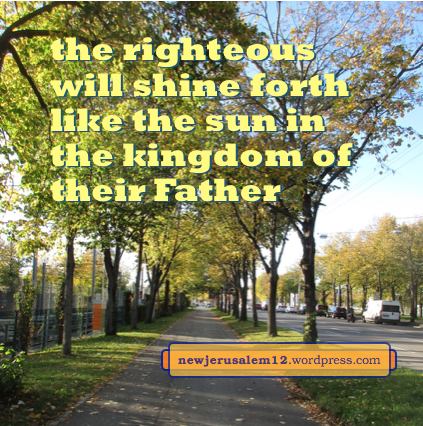 “Father” here indicates that the righteous will shine forth because of the Father’s life, which is Christ in us. The righteous will shine because their living is Christ, who becomes their practical, experiential righteousness. This is the longing expressed by Paul in Philippians 3, to be found in Christ, having the righteousness which is out of God and based on faith. To be in Christ and to be positionally righteous in Him is a fact. To be found, to be seen by others, in Him and to be found living out God’s righteousness, is much more. Such a living produces the shining in the kingdom and the bright clothing of the bride, New Jerusalem (Rev. 21:2). New Jerusalem is pure: “the city was pure gold, like clear glass” (Rev. 21:18), “the street of the city was pure gold, like transparent glass” (21:21). 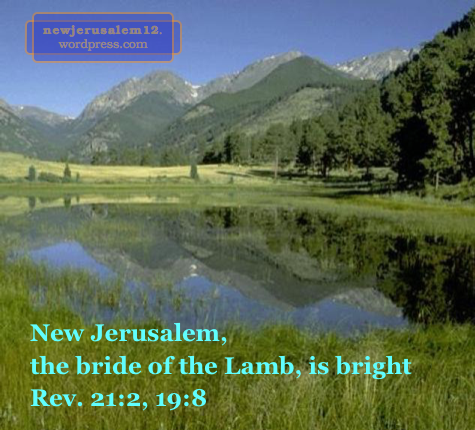 New Jerusalem is the bride, the wife of the Lamb (21:9); “it was given to her that she should be clothed in fine linen, bright and clean/pure; for the fine linen is the righteousnesses of the saints” (Rev. 19:8). For us to match the purity of New Jerusalem, first the Lord cleanses/ purifies our hearts by faith (Acts 15:9). Second, He cleanses us from unrighteousness as we are enlightened and confess our sins (1 John 1:9). Third, He purifies us as we cooperate with His moving in us both to depart from unrighteousness and to let Him live through us as righteousness. Ephesians 5:26 is also in the third step of this cleansing/purifying. 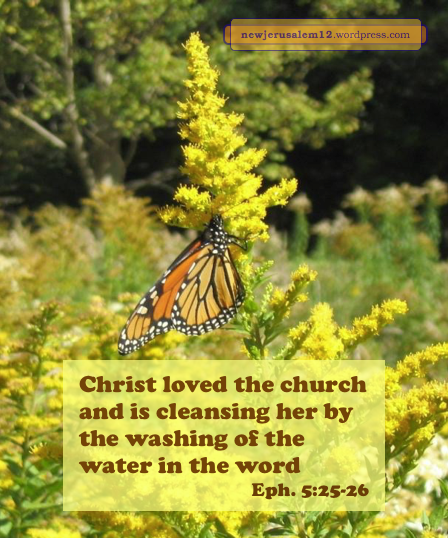 The Lord sanctifies the church, “cleansing her by the washing of the water in the word.” Here word is the Greek rhema, which means the instant word, the particular word or speaking enlivened to us as we read or remember the printed words of the Bible. These rhema words to us “are spirit and are life” (John 6:63). They might be as simple as “no” to separate us from something of the world. When we respond to these words, the life in us has a way to flow. This is “the washing of the water in the word.” By this washing we experience a little more of the purity of New Jerusalem. *From the footnote on James 4:8 in NT Recovery Version Online. For the verses cited in this post, clean and pure both come from the same Greek noun and cleanses and purifies both come from the related Greek verb. Psalm 110 is a prophecy concerning Christ, often quoted in the New Testament*. This Psalm is about the present spiritual warfare and the defeating of God’s enemies. 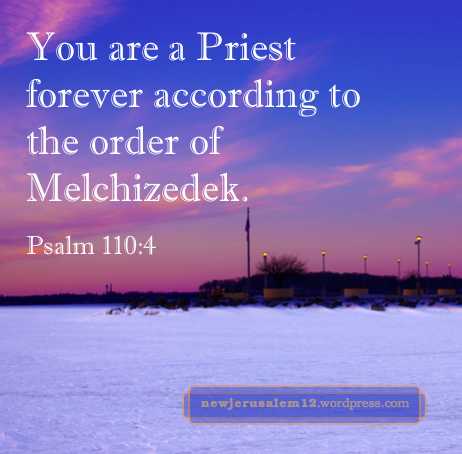 By the time of the new creation and New Jerusalem all the enemies will be gone, cast into the lake of fire, but Christ will endure as “a Priest forever” (v. 4). Psalm 111:9 says “He has sent redemp-tion to His people; He has commanded His covenant forever.” The redemption sent to us is in Christ (Rom. 3:24). This redemption (Gal. 3:13) brings us the blessing of the Spirit covenanted to Abraham (v. 14), a blessing which continues “forever” as portrayed by the river of life in New Jerusalem. Psalm 117:1 says, “Praise Jehovah, all you nations; laud Him, all you peoples.” Although not realized now, it will be after the Lord returns and even more fully in the new creation. Psalm 118:19, “Open to me the gates of righteousness: I will enter in through them; I will give thanks to Jehovah.” At present we have the gate unto eternal life (Matt. 7:14); in Christ we have the righteousness which allows us to enter this gate and receive eternal life (Rom. 1:17, 5:17-18). Eventually this will be the gate into New Jerusalem, still open because of Christ as our righteousness unto full enjoyment of Christ as our life. * V. 1 in Matt. 22:44, 26:64, Luke 20:42-43, Acts 2:34-35, Heb. 1:13; and v. 4 in Heb. 5:6, 7:17.